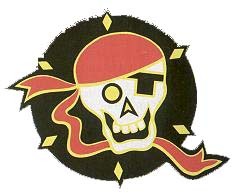 Insignia of the 14F squadron. The unit was born on January 15th 1953 and led by LV Ménettrier. It received several F4U-7 Corsairs, and was sent to Indochina. Over there, it made its first victories from 1954 over Diên Biên Phu and the Delta of Tonkin. 1,422 missions, 1,834 flight hours, 1,565 t of bombs, 120,000 20 mm shells spent over Indochina !!! It came back to France in July 1955, but, it left again the country, and was engaged in the Suez Canal War. It operated from CVL Lafayette and CV Arromanches cruising off Egypt. Based at NAS Hyères, it was involved again, over Algeria (CAS missions) from Telergma, Alger, Tebessa and Biskra airfields. On August 8th 1961, the 14F reached NAS Karouba, one week later 'Bizerte events'. It provided reconnaissance missions over Tunisia. In August 1963, it was the only Karouba-based French Navy squadron.When Algeria became independent, it moved to NAS Cuers where it was disbanded in October 1964. Eleven years on Corsair flown by the 14F : 40,845 flight hours, 4,690 deck landings and 2,201 catapultings. On March 1st 1965, the 14F was re-born, led by LV Goupil, based at NAS Lann-Bihoué and equipped with twelve F-8E Crusaders which was the new aircraft of the French Navy at that time. On August 1st 1968, Crusaders left their base, and moved to NAS Landivisiau. Various detachments composed by Crusaders of the 14F and based aboard French carriers were sent around the world : from October 1974 to March 1975. Then, from June 1977 to December 1977. Fourteen years flying on Crusader : 45,472 flight hours and 6,800 deck landings. On April 17th 1979, the last "Crouzes" of the squadron were scrapped. Those aircraft were replaced on June 1st 1979 by the new strike aircraft of the French Navy, the Dassault Super-Etendard. The squadron was disbanded again on July 1st 1991, but it should be reactivated around 2001, and equipped with the most modern embarked multi-purpose aircraft of the world, the Rafale M !!! The squadron provided close air support missions, conventional and nuclear assaults for the fleet, and anti-ship missions for the French Armed Forces.